This chapter deals with existence and uniqueness results for variational and quasi-variational inequalities. With the intention of focusing the differences among the proofs of results, we first consider elliptic variational inequalities of the first and second kind with linear and continuous operators in Hilbert space or monotone and hemicontinuous operators in Banach space. Next, we deal with elliptic quasi-variational inequalities involving monotone and hemicontinuous or potential operators. The last section concerns the study of a class of evolutionary quasi-variational inequalities. 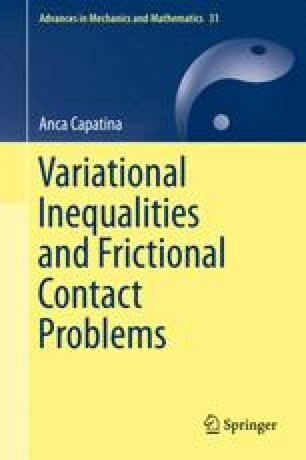 The results presented here will be applied, in the last part of the book, in the study of frictional contact problems.